While I don’t generally like bread puddings all that much, and have mentioned that I far prefer ones that can be sliced, like my Restaurant Style Bread Pudding, to ones that must be scooped, there are a few that aren’t too bad. And there are also occasions when it is good to know how to whip one up, since they are versatile, easy and quite popular. This one falls into the “not too bad” category – by which I mean that it is very good. I’m just not quite willing to come to terms with my enjoyment of this particular bread pudding just yet. I’m sure that once I’ve made this another time or two, I’ll come around. Bread pudding is chopped up, slightly stale bread that has been soaked in a milk/egg mixture. I usually cut my bread into 3/4-inch ot 1-inch chunks and let it sit out during the day to “stale.” I rarely have bread that is stale on its own and I just can’t be bothered to toast all those bits of bread. It will dry out sufficiently after sitting out, uncovered, for a few hours. If you’re going out, it’s a good idea to cut up the bread in the morning, so it will be ready when you get home and want to make your pudding. The custard is whipped up very, very quickly. I always set out my eggs with the bread so they’re at room temperature when I go to work with them, but if you store yours in the fridge until the last minute, you can put them in a bowl of slightly warmed water for about 5 minutes to take the chill off. This will allow them to incorporate more easily into the batter. For a sweet custard, I would add some sugar, but here I simply used salt, pepper and a bit of parmesan cheese – which went a surprisingly long way. Rather than cleaning a bunch of artichokes, I used canned ones that were packed in water (not oil) and diced them, saving time and effort. Overall, the bread pudding was a hudge success. Aside from tasting cheesy with bits of artichoke, it’s difficult to describe the flavor exactly. The flavors of the egg and the whole wheat bread are strongly present, but the whole thing actually blended together very, very well. I’d make it again in a heartbeat for company because, though it looks quite homey, the flavors are very clear and would go well with a whole host of other dishes. In a large bowl, whisk together eggs, milk, salt, pepper and parmesan cheese. Stir in bread chunks and artichoke hearts. Let mixture stand, pressing down occasionally, for at least 15-20 minutes so the bread can soak up the milk mixture. Pour into an 8-inch square baking dish (ungreased) and bake for 40-45 minutes, until a knife comes out fairly clean (but moist) when inserted into the center. Serves 9, as a side, or 6, as a main course. The May/June (hmm maybe April/May) issue has a different take on savory bread puddings … I’m still on the hunt for a perfect tomato bread pudding. I just made my 1st savory bread pudding last week–it was from a Deborah Madison cookbook, the one for farmer’s markets. Asparagus and mushroom bread pudding–it was heavenly, and even better as leftovers the next day. What if you added some sun dried tomatoes?? 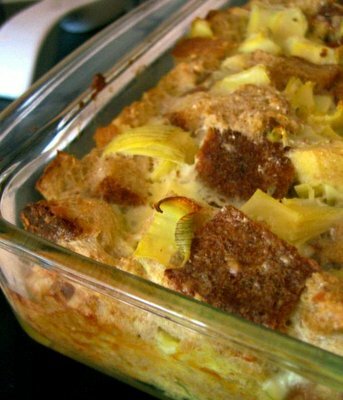 Hi Nic – I’ve never tried a savory bread pudding, but the idea appeals to me. You sound like my mom, who has always had an aversion to bread pudding on general principles (she thinks it’s not good to eat a lot of bread – I don’t have that problem!). Alanna – May/June issue of Eating Well? I thought their recipe had too many eggs and not enough milk. Lucette – Sounds like a good combination! Anonymous – You counld certainly toss in a few drained, chopped sundried tomatoes, if you like.